When it comes to yoga, I’m a streaker. Wait, that didn’t come out right. What I mean to say is that I tend to attend a bunch of yoga classes all at once, usually during a break from running, and then attend sporadically when my training ramps back up. Balance, you know. I love yoga (yes, not all of us here at Salty Running hate it). I love it for the yogi’s high (is that a thing? ), but also because it makes me a tougher runner. It makes me tougher physically: the exercises help me to build upper body and core strength and activate all the leg muscles that high mileage tends to make out of whack. However, the biggest benefit for me is that yoga improves my mental toughness! Yoga teachers may catch some flak for sounding kooky at times, but many are full of wisdom. Some of their advice might even remind you of Ginger’s tips for being more mindful when you run. So even if you’re a yoga hater (*cough* Salty *cough*), here is why you should consider mixing in some yoga to your training. Like a lot of you out there, I like to balance out my training with a little yoga. In fact, my only form of cross-training is yoga – it’s the only activity other than running that I can stick to doing on a regular basis. My affinity for yoga makes perfect sense: As us Salties know, running is as much mental as it is physical, just like yoga. The reason I’m talking about yoga today is that I had the opportunity last Friday to meet the mother of all yogis, Kathryn Budig. 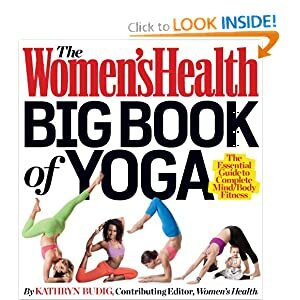 Kathryn contributes to publications including Yoga Journal, Women’s Health and Huffington Post. Her new book, the Women’s Health Big Book of Yoga, was just released on October 30. She travels around the country, teaching workshops and giving talks to inspire others. She visited Cleveland last weekend and I had the privilege of meeting her. Kathryn visited my store (!!) to be outfitted for the weekend. It was like the yoga equivalent of meeting Kara Goucher or Shalane Flanagan!